On February 21, 1968 promotor Ed Francis presented his second professional wrestlng card held at the Honolulu intrnational Center arena. The main event featured a main event where new Hawaiian Tag Team champions were to be crowned in the ring. Five matches took place before the main event. In the opening match of the night, Lord Blears and Harry Fujiwara battled to a draw. In other matches Ken Hollis defeated Jackie Carson,, and Angelo Poffo defeated Alberto Amessa. 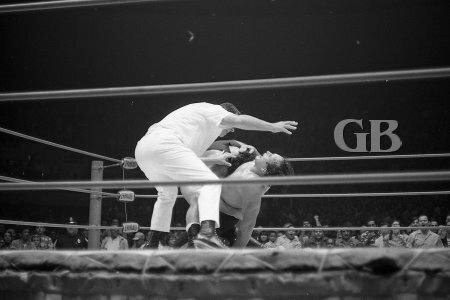 The match between Pepper Gomez vs. Killer Kowalski ended in a draw after each wrestler split falls. 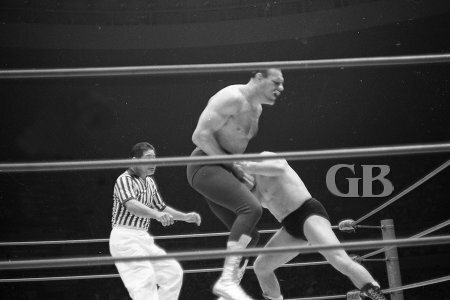 Pepper Gomez delivers a blow to Killer Kowalski's midsection. Gomez about to land squarely on Kowalski's chest. 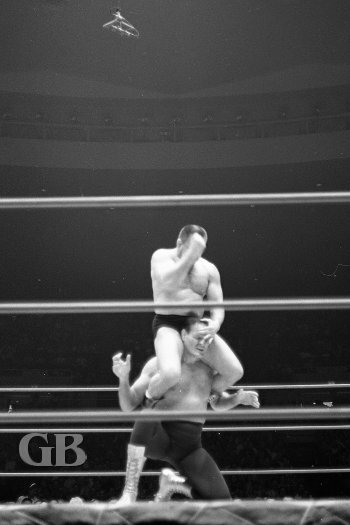 Pepper Gomez catches a ride on Killer Kowalski's shoulders. 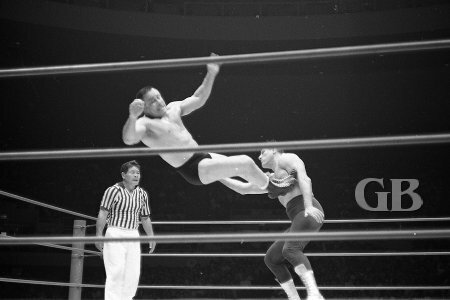 Pepper Gomez lands a glancing blow with his drop kick onto the wily Kowalski. In a tag team match the team of Bearcat Wright and Sailor Art Thomas defeated Freddie Blassie and Curtis Iaukea on a disqualification. 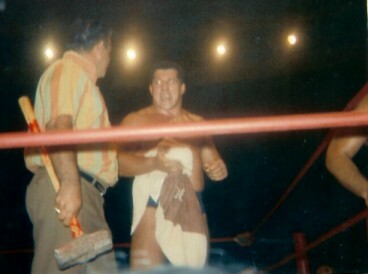 Sailor Art Thomas confronts a cowering Fred Blassie in the corner. Bearcat Wright lands a solid elbow to the chest of Curtis Iaukea. 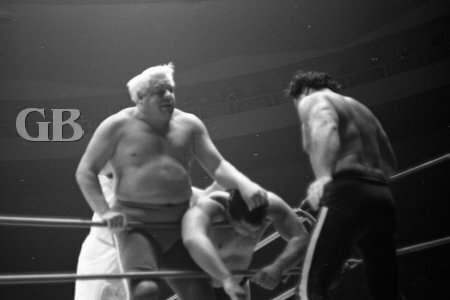 Fred Blassie takes a bite out of Bearcat Wright's forehead. 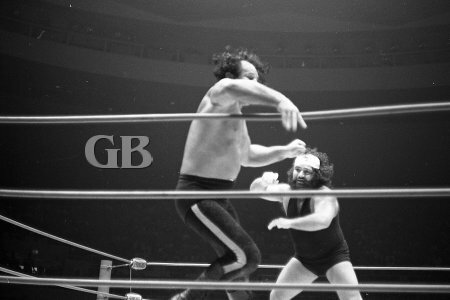 Curtis Iaukea cranks up the pain on Bearcat with his nerve hold. Not so fast, Mr. Blassie. I still have one more blow to deliver. In 1967, Johnny Barend & Jim Hady were the Hawaiian Tag Team champions. They lost their titles to Curtis Iaukea & Dutch Schultz (AKA Dutch Savage) in September of that year. Barend and Hady recaptured the title in November and one of the conditions of the rematch was that if Barend and Hady won the titles back, Johnny Barend would get a shot at Iaukea's United States title on Christmas Day. On Christmas day Barend defeated Iaukea for the U.S. Championship and when Jim Hady went to shake his hand, Barend pushed him away. The following Saturday on KGMB's 50th STATE WRESTLING, Barend attacked Hady and told him "He was no longer his tag team partner and would pick someone else to co-hold the Hawaiian tag title. That someone else turned out to be Barend's old partner Ripper Collins. Subsequently, Jim Hady brought the Missing Link back to Hawaii to be his new partner. (Barend & Collins originally brought in The Missing Link in 1966 as their partner in 6-man tag matches, but The Link eventually turned against them, much to the delight of the fans. In June of 1966, during a United States Title match against Johnny Barend, The Missing Link was seriously hurt by Barend. Later that week on the Saturday TV show, the Link was attacked by Barend & Collins and resulted in the Missing Link spending over over a month at Queen's Hospital. When The Missing Link got out, he had a series of grudge matches with both Barend & Collins. Both teams, Barend & Collins and Hady & The Missing Link, claimed to be the Hawaiian Tag team champions. Finally, Ed Francis ordered a match to determine the champions. The match turned out to be a "Belt vs. Trophy" match. When Barend & Hady split, Hady had the tag team belts on him and Barend pulled out a tag team trophy used before the belts were issued and he claimed the trophy was for the tag team champions. At the end of the match, the winners would destroy the other team's claim to the title; either the trophy or belts would be destroyed in the ring. 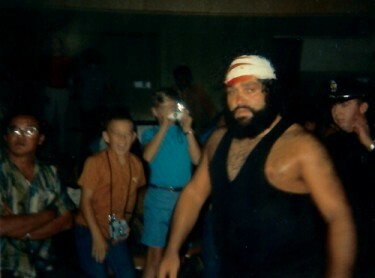 On the TV interviews before the match, Barend stated that Collins could just kick back in the corner of the ring and he would beat Hady & The Missing Link in two straight falls: The first fall would be "Hawaiian" style, where he would false crack one of the two, and the second fall he would win "Samoan" style, where he would bring a rock in the ring and sneak up from behind and hit one of the two over the head with it. Ripper Collins floors Jim Hady with a flying tackle off the ropes. The Missing Link cranks up the pressure with his Bear Hug on Johnny Barend. Hady tried his best to battle both Barend & Collins but he received a brutal beating. All of a sudden the Missing Link returned with a blood soaked bandage on his head-- the crowd went crazy. The Missing Link entered the ring, went nuts, and pinned Johnny Barend, knocking him out in the process. Jim Hady & The Missing Link won the match in two straight falls and were crowned the one and only Hawaiian Tag Team Champions. After the dust had cleared, the tag team trophy belonging to Barend and Collins was sledge hammered in the middle of the ring to the delight of over 8,000 fans at the Honolulu international Center. Barend tries desperately to escape the Link's lethal Bear Hug. Collins and Barend take turns meting out punishment on Jim Hady while The Missing Link is away in the locker room. The Missing Link returns with a vengeance as Johnny Barend is quickly disposed of. 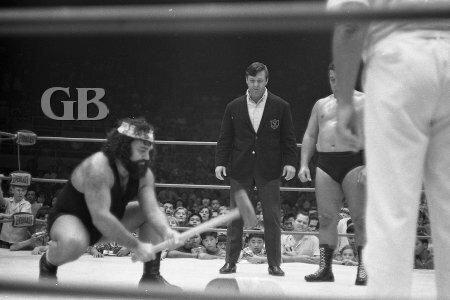 Promoter Ed Francis and Jim Hady watch as The Link uses the sledge hammer to destroy the tag team trophy that once belonged to Collins & Barend. Jim Hady about to take a few whacks at the old trophy. Whacking away at the trophy.